*Extract, fruit, cocoa, white chocolate, marshmallow cream, etc... can be added to frostings to create the flavor of your choice! I have been decorating edible art for 12 years. I started my journey at Michael’s Art & Crafts taking their cake decorating classes. I also watched a lot of online videos and as well taking culinary classes to push me further into the industry. When I am not at work, I am with my 5 children and my boyfriend and his 4 children. We have a busy home and work life, which I wouldn’t trade for the world! I grew up in a big family. My Mother would sign us up for the Farmer’s Market, making cinnamon rolls and Kolaches. Fast forward to my 20’s and I wanted to do something that I liked and I could meet new people. I started baking for the Ankeny’s Farmer’s Market and I did that for 8 years. I always wanted to have my own bakery. One day Michelle and I decided that we should go into business together. I love making breads, pies, and decorating cookies. In my free time, I am with my Pitbull Lucy and participating in 5k’s, 10k’s and half marathon’s. I have been with Sweet to Eat for 3.5 years. I have always loved baking and I enjoy working here. I have been married to my husband for 10 years-we are high school sweethearts. We have 2 kids that keep me busy. When I’m not at work, I’m at a sporting event or practicing with my kids in the backyard! I have been married to my wonderful husband Cameron for 29 years. We have 3 children together, Gabriella, Ethan and Isabella. I enjoy cooking and baking, reading and all sorts of crafts-especially sewing and quilting. 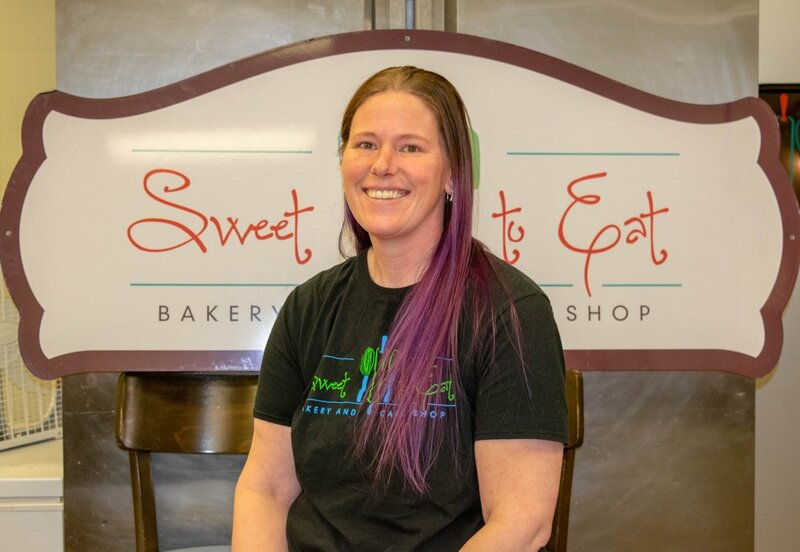 I am the newest team member at Sweet to Eat. I am excited to learn more about the wonderful world of baking! From a young age I was always interested in baking. I would bake cookies & cupcakes for my friends and take them to school. I graduated from Kirkwood Community College with degrees in Culinary Arts, Baking and Pastry Arts / Restaurant Management. I enjoy baking, especially decorating. I love to see how happy customers are when they pick up their cakes! Please take a moment to visit our vendors! They carry our products and support us, so we want to show them some love too! "We’re always excited to see the fresh items they put in the case daily, especially buns"
"They are easy to work with and their bread is amazing!" "We love having fresh homemade products to give to our customers."